Through the ages, people have documented total solar eclipses. Here, an artistic depiction of the July 29, 1878 total solar eclipse by E.L. Trouvelot. 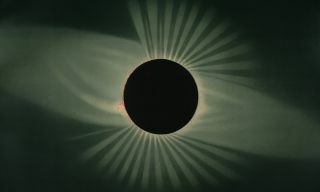 Due to their very nature, prehistoric records of solar eclipses are the hardest to interpret. Does that swirly thing represent the sun? Are the concentric circles the full moon? The new moon? And what about those zigzags? If we're correctly interpreting the petroglyphs on the ancient monuments near Loughcrew, Ireland, then the oldest recorded solar eclipse dates to 3340 B.C. I should mention that the Chinese went on to record nearly a thousand eclipses from the eighth century B.C. until the fifth century B.C., with no associated beheadings reported. They weren't alone, however. The Babylonians and Greeks busied themselves recording solar eclipses, using colorful language like "the sun was put to shame," as one ancient clay tablet attests. Solar eclipses were too hard to predict with any degree of confidence with the limited accuracy available to the ancients — poor consolation to the Chinese court astronomers, I know — but as far as we can tell, all the civilizations that kept track of eclipses quickly realized that they were a result of the natural motions of the sun and moon. Entering the scientific era of astronomy, solar eclipses began to be used for more than just finding a tenuous connection to the fortunes of the big boss. Observers began to study the corona in more detail, discovering helium (Helios, like the Greek god of the sun — get the name now?) in the process. Later on, they would be used to verify the prediction of general relativity that massive objects can bend the path of light. These days, as on Aug. 21, they will be an opportunity to ooh and ah at the beauty of the natural world while simultaneously doing research. And no beheadings.